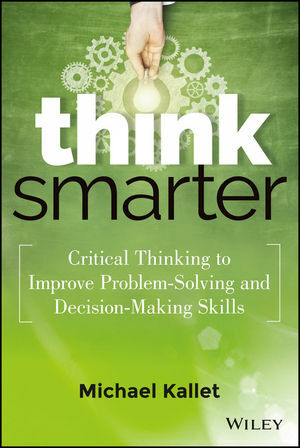 Think Smarter: Critical Thinking to Improve Problem-Solving and Decision-Making Skills is the comprehensive guide to training your brain to do more for you. Written by a critical thinking trainer and coach, the book presents a pragmatic set of tools to apply critical thinking techniques to everyday business issues. Think Smarter is filled with real world examples that demonstrate how the tools work in action, in addition to dozens of practice exercises applicable across industries and functions, Think Smarter is a versatile resource for individuals, managers, students, and corporate training programs. Learn what questions to ask, how to uncover the real problem to solve, and mistakes to avoid. Recognize assumptions your can rely on versus those without merit, and train your brain to tick through your mental toolbox to arrive at more innovative solutions. Critical thinking is the top skill on the wish list in the business world, and sharpening your ability can have profound affects throughout all facets of life. Think Smarter: Critical Thinking to Improve Problem-Solving and Decision-Making Skills provides a roadmap to more effective and productive thought. MICHAEL KALLET founded HeadScratchers in 2004 to train business professionals and leaders in critical thinking, problem solving, decision making, and creativity. Through workshops, webinars, and keynote speeches, he teaches people to apply critical thinking techniques to real world business challenges. Mike has held leadership positions in business environments ranging from ten-person startups to a $500 million public company.